(by Julian Robinson, UK Daily Mail) – Up to 35,000 soldiers will take part in Nato military drills across Norway this year – the largest the country has seen since the Cold War. Air, land, maritime, special operation forces and amphibious forces will also participate in what is one of the biggest Nato exercises in recent years. 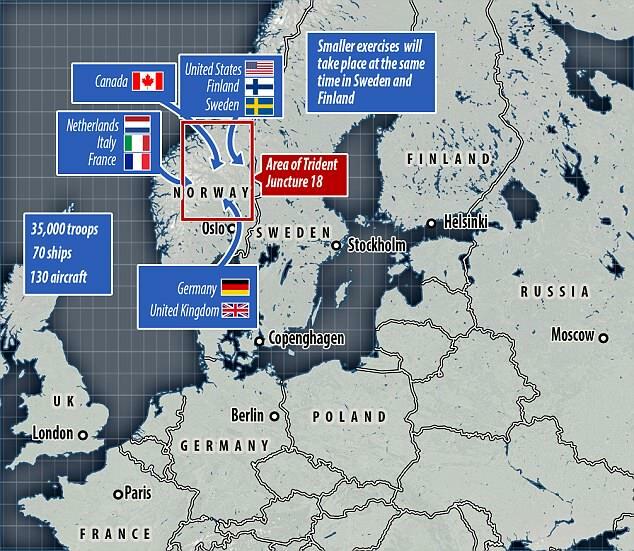 Frank Sølvsberg, spokesperson for Trident Juncture, said the drills will be three times larger than any other prior military exercise carried out in Norway. “This will be a very big and important exercise that will affect many,” he is quoted as saying. The operation will be so big Norwegians have been warned it will affect more than a hundred municipalities ‘directly or indirectly’. The main drills will take place between October 25 and November 7 but preparations will get underway as early as August. The drills come as tensions continue to mount between Russia and Western nations over the Syria crisis. Vladimir Putin has backed the regime of dictator Bashar al-Assad during the country’s devastating civil war. But America, France and Britain have joined forces to launch air strikes on suspected chemical weapons plants in the war-torn nation after a poison gas attack on a rebel-held town. NATO Spokesperson Oana Lungescu told MailOnline: ‘To keep our nations safe in an unpredictable world, we need to make sure that our Alliance is strong. Published at UK Daily Mail on April 17. NOTE: Before answering the following questions, read the info under “Background” and watch the video under “Resources”. b) Where specifically will the military exercises take place? c) What branches of the militaries will take part in these NATO exercises? d) How often is Trident Juncture held? Where was it held last? e) What is the purpose of the Trident Juncture exercises? Be specific. 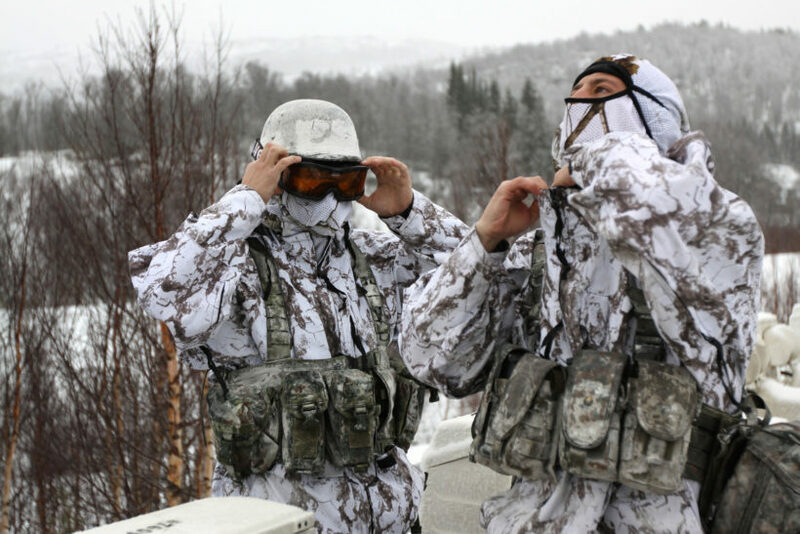 Meanwhile, Norway’s foreign minister said this week that her government was discussing whether to ask Washington to extend the stay of U.S. Marines in the country, a presence that has angered Moscow. Some 330 Marines are scheduled to stay until the end of this year after an initial contingent arrived in January 2017, the first foreign troops to be stationed in the NATO member state since the end of World War Two. ‘We are currently in a phase where we are discussing different options, but I think from our point of view it has been very useful and very successful,’ Ine Eriksen Soereide told Reuters in an interview. The minister reiterated that Oslo did not see Moscow as a military threat and that the threat of war in the Arctic, NATO’s northern flank, was ‘low’. The Russian embassy in Oslo told Reuters on Saturday the extension of the presence of U.S. Marines on Norway’s soil would worsen its relations with Moscow and could escalate tensions on NATO’s northern flank.